Do you suffer from foot aches due to conditions such as Plantar Fasciitis? Or do your feet feel tired & sore simply from standing too long? If so, consider getting the TheraFlow Mini Foot Massage Roller to help relieve some of those aches & tension. 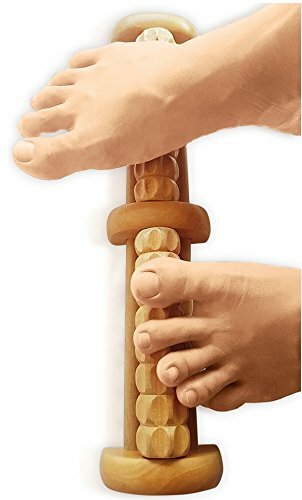 The TheraFlow Mini Foot Massage Roller is designed to be a simple & cost-effective way to treat your feet, especially the arch of your feet that can be hard to reach using other methods or devices. 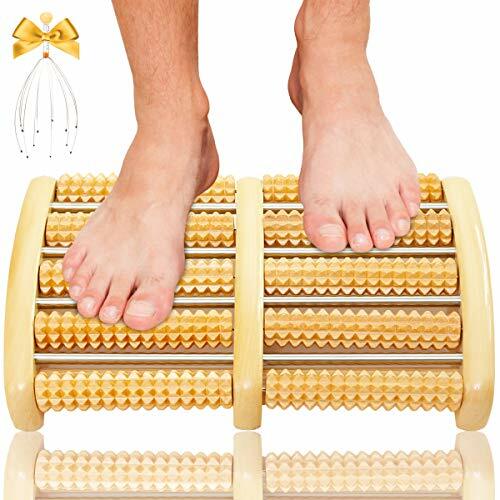 Get the TheraFlow Mini Foot Massage Roller today - your feet will thank you! Say Goodbye To Foot Pain & Body Aches. Are you troubled by foot pain? Afraid to take that dreadful first step in the morning? Or do you suffer from foot issues due to diabetes like diabetic neuropathy? ---------- Benefits ---------- 2 Independent Rollers Mean You Can Use It On Both Feet At The Same Time. Also works on most other parts of the body! -------- Buy Risk Free -------- This Product Is Covered By Our No-Hassle Guarantee. We will replace or refund your purchase if you are not satisfied with it. Simply contact us & we will do our best to resolve any product issues for you. Do yourself & your feet a favor today by getting the TheraFlow Dual Roller. Click on the 'Add to Cart' Button Now! Sole Scrubber by Love, Lori is an invigorating shower foot scrubber that cleans feet and in between toes without having to bend over. With hundreds of scrubbing bristles your feet will get a clean like they have never felt before. Treat yourself to a foot spa experience at home. Not only will our sole scrubber clean your feet but it is a foot massager that will massage your tired achy feet so they can feel happy again. Reach every pressure point and massage as hard or as light as you'd like. But wait there's more! Our foot scrubber helps to improves foot and leg circulation. Good circulation is vital to a persons health. Foot massage is one of the different ways to improve foot and leg circulation for a happier and healthier you. Say goodbye to athletes foot and foot odor. Athletes foot and foot odor is nobody's friend. Fight athletes foot and foot odor by combining your favorite athletes foot wash and tea tree oil and scrub away toe fungus and foot odor. Total foot care is necessary, and it goes beyond cosmetic purposes. Our feet are our center of energy. They hold us up, balance our bodies and take us where we want to go in life. Healthy feet benefit the entire body, so it is vital that we look after them. So start taking care of them by purchasing your Sole Scrubber today! Shower Foot Scrubber - With hundreds of scrubbing bristles your feet will get a clean like they have never felt before. The bristles get into hard to reach areas between your toes without having to bend over. Treat yourself to a foot spa experience at home. Foot Massager - Our foot massager and scrubber will massage your tired achy feet so they can feel happy again. Reach every pressure point and massage as hard or as light as you'd like. Improves Foot And Leg Circulation - Good circulation is vital to a persons health. Foot massage is one of the different ways to improve foot and leg circulation for a happier and healthier you. Fights Athletes Foot And Foot Odor - Our Bathtub Foot Scrubber Fights Athletes foot and foot odor is nobody's friend. Fight athletes foot by combining your favorite athletes foot wash and tea tree oil and scrub away toe fungus and foot odor. The protruding acupressure knobs deliver the same therapeutic effects of a deep- tissue massage, providing significant physical therapy and all-around pain relief. Specifically designed to relieve foot pain caused by conditions such as plantar fasciitis, heel spurs, metatarsalgia and ball-of-foot pain. Say Goodbye to Your Foot Pain - The protruding acupressure knobs deliver the same therapeutic effects of a deep- tissue massage, providing significant physical therapy and all-around pain relief. Specifically designed to relieve foot pain caused by conditions such as plantar fasciitis, heel spurs, metatarsalgia and ball-of-foot pain. 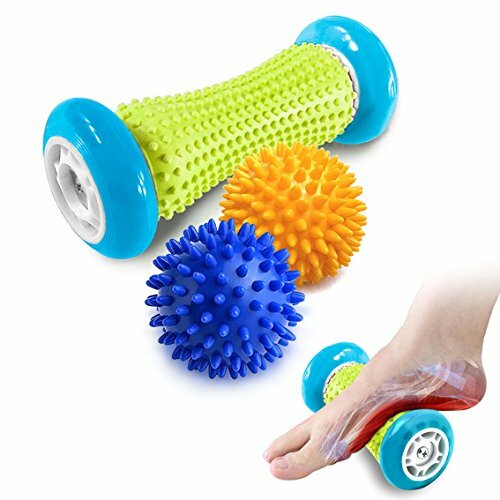 [1 Foot Massage Roller Plus 2 Spiky Massage Balls] - Foot Massage Roller Designed to be 6.7 inch in length with 2.7 inch in diamete, PVC material. Durable PU and TPE protect the foot roller from losing shape. Environmental protection and no peculiar smell. MULTIPURPOSE USE: Perfect tool to relieve all sorts of muscle pain, not limit to foot. Can use toward legs, hand, wrist, shoulder and neck. Small and compact size let you bring it anywhere with you. Acupressure Reflexology Design Makes it Effective to Improve Blood Circulation and Boost Lymphatic Drainage, Give Your Metabolism a Kick-start, Relieve Tight Muscles and Joints Pain, Treat Headaches and Migraine, Offer Good Relaxation and Regulation for Your Body, etc. LIFETIME GUARANTEE: We offer a one-year money back guarantee. We pay attention to customer service and product quality and dedicated to providing high quality products for customers.We welcome all feasible advises. The Due North Foot Rubz massage ball stimulates acupressure points in your feet, hands and body, helping to relieve soreness and pain. It can even provide temporary relief from plantar faciitis. Roll this uniquely designed ball under your feet, in your hands or over any sore or tired muscle and feel the soothing stimulation that immediately begins to relax and eliminate your tension. You control the depth of massage with applied pressure to ensure the utmost relief of muscle soreness. Small enough to fit in the palm of the hand, this easy-to-use massage ball is great for use anytime, anywhere. 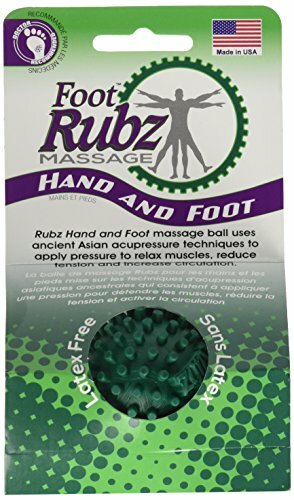 Based on ancient Asian accupressure techniques, this little ball massages trouble spots on hands and feet. Plantar pain but no way to relieve?Now it is solved by this wooden foot massage! Design by Ergonomics,this foot massage tool is an effective therapy for sore feet,and it matches human feet radian. As for its material, this wooden foot massage is made of durable polished solid wood, material and it use the green paint. This product is light and portable at 1.2lbs. Most people suggest that it is a good gift for parents! For those who has neuropathy, plantar fasciitis,plantar pain,one step on this wooden foot roller massage,release yourself from pain. Stimulate your plantar through the rhombus tips on each roller,soothe the feet. It is made in a dimension of 10.6 x 6.7 x 2 inches,and easy to keep. Now making a new experience of massage for foot on this wooden roller massager! Specially designed for people who has neuropathy, plantar fasciitis,plantar pain,work as an acupressure therapy. Lifetime guarantee: we offer 1Years Manufacturing Warranty,Covers defects/ damage. We will replace or refund your purchase if you are not satisfied. 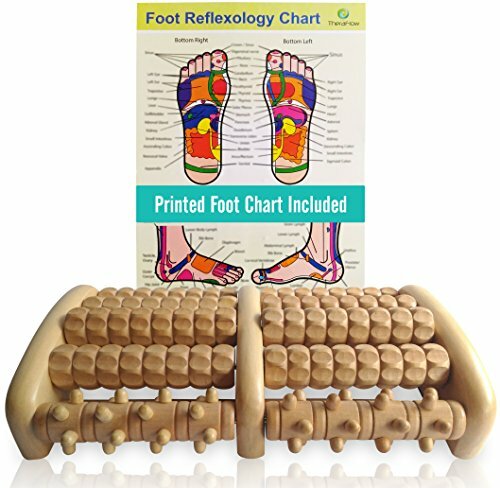 FOOT ROLLER REFLEXOLOGY - Both massage roller and the spiky balls can be relief plantar fasciitis and used on your hands, forearms, shoulders, back, feet, hamstrings etc offer a stimulating effect and increases circulation throughout the entire body. PRACTICAL CONSTRUCTION - Made from safe, Non-toxic, No chemical smell, washable and durable TPR and PVC material, these massage balls and foot rollers are designed to last. No need assembly and easy to use. TREATMENT PLANTAR FASCIITIS - This is great to massage tired achy feet and treatment plantar fasciitis. Just by simply rolling your feet on this foot massager times a day to treat muscle spasms, release tight and knotted muscles, relieve pain and pressure. 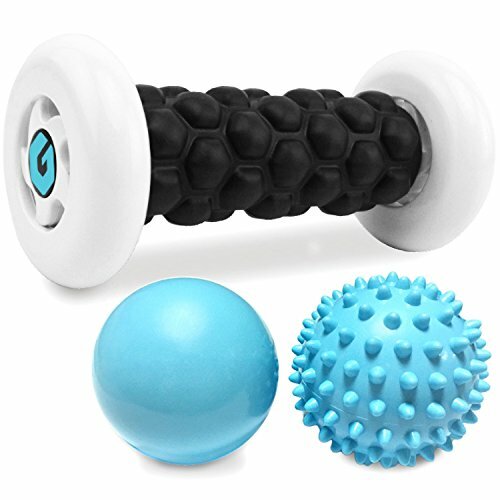 EASE MUSCLES SORENESS - the massage roller and balls are not wood quality so will not cause hurt or tickle feeling. Just enjoying gentle massage but useful relief muscle pain. This set is good for different use purposes. 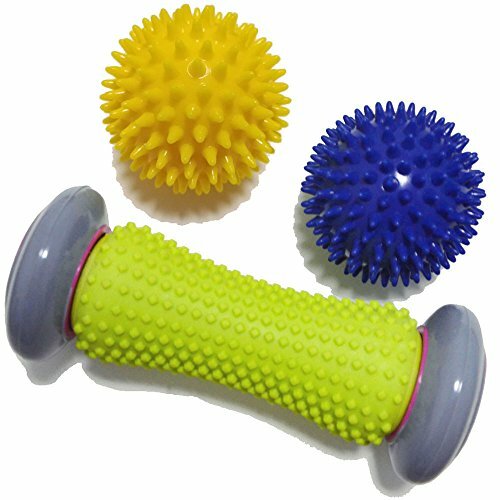 INCLUDED 1 FOOT ROLLER AND 2 SPIKY BALLS - The Set with 1 Foot roller and 2 spiky massage balls in special designed exquisite box packing, easy sanitize and clean. Not only you can use at home, office, travel but also a good gift choice. Standing all day can do a real number on your feet, legs, and back! Each year in America, over 2 million foot injuries are reported. Taking good care of your feet can go a long way towards staying healthy, comfortable, and pain free. 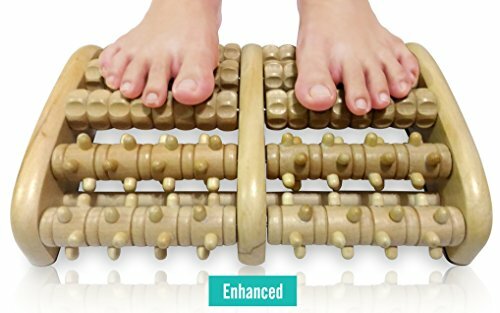 Our High Density EVA Foot Roller combined with the cold therapy massage balls can help you - especially if you re suffering from chronic tired feet, stiff leg muscles, plantar fasciitis, heel spurs, swollen feet, poor blood circulation, and other symptoms of foot pain. Cold therapy - place ball in freezer for 4+ hours, or simply store in freezer overnight - gel will keep cool for approximately 20 minutes. All this for less than half the cost of a single foot massage, and your feet will be forever thankful. Try it risk free - if you re not completely satisfied with our foot roller combo, simply return it within 30 days for a full refund. Add to cart now! INTENSELY EFFECTIVE - The most effective combination for relieving pain from plantar fasciitis, heel spurs, and tired achy feet. GREAT VALUE - You get a premium foot roller, and 2 super effective massage balls, PLUS A BONUS carry bag - all for less than the cost of a foot massage. SATISFACTION GUARANTEED - We guarantee you'll love it! If you're not 100% satisfied, simply return it for a full refund, no questions asked - try it risk free! Brand: Gillsun Fitness | Manufacturer: Gillsun Fitness Co. EXPERT APPROVED THERAPEUTIC MASSAGE SANDALS - Proven by Alexandra Ellis, self-care expert and wellness coach, our reflexology sandals women and men have natural cobblestones with many functions, such as relieve stress, prevent leg cramps, improve metabolism, immune function, and blood circulation. DEEP TISSUE MASSAGE FOR YOUR FEET - Note: You may feel a little uncomfortable or pain during the first few usages, wear socks and shorten the time usage to help your feet adjust. The pain indicates that the product really work, you will get used to it and start to crave it because they hurt so good! COMPLETELY ADJUSTABLE TO COMPLEMENT ANY FOOT SIZE - Our acupuncture slippers comes with effortless-to-adjust velcro straps. You can alter the width of our foot massager for plantar fasciitis, ensure they fit comfortably on your feet. YOUR OWN FOOT SPA ANYWHERE, ANYTIME - Enjoy a mini shiatsu treatment when walking or even standing by wearing our slipper massager. Hurry and place your order now while we have an offer you can check on check out. California Home Goods is a homegrown brand that's dedicated to making your life a lot easier and more beautiful. We have a line of unique home products that are designed with your needs and comfort in mind. Our Shower Foot Scrubber Cleaner Massager with Non-Slip Suction Cups will make your morning showers more luxurious . This one of a kind foot cleaner and massager will r ejuvenate your feet from within using high-quality bristles that slough away dead skin cells in minutes. This unique foot scrubber has thousands of firm bristles that will slough away dead skin cells and rejuvenate you from within by promoting better blood circulation. Have the best foot scrub of your life in the comforts of your own bathroom. Our foot spa massager will transform the way you take your showers, whether it be in the morning or at night. Our feet cleaner is made to last for years. Each foot massager is meticulously inspected and carefully packaged to your satisfaction. Each foot massager comes with a firm yet gentle foot brush. This ingenious product is designed to give you the best foot spa experience whenever you want it. Each order comes with one (1) feet massager. SPA FOR YOUR FEET: Massage, clean, condition and rejuvenate your feet with our foot massager, scrubber, and washer - a foot spa treatment for your feet in your daily bath and shower. 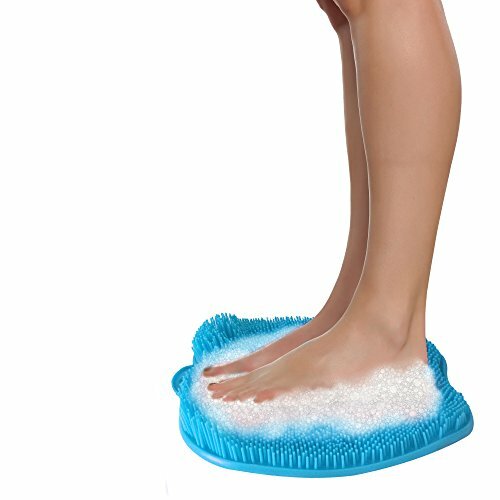 Our foot scrubber is designed to give you the ultimate foot spa experience in the comforts of your own home. FOOT CARE CLEANER AND MASSAGER: Our foot massager features more than a thousand massaging bristles for the ultimate invigorating brush action. Removes dead skin, thoroughly cleans soapy feet, including the often neglected areas between the toes; the back features a strong suction cup to prevent slippage. This foot washer not only cleans your feet but improves blood circulation, giving you the added energy boost you need to start your day right. HEALTHY CLEAN, PROMOTES CIRCULATION: Stimulates circulation and blood flow to the feet and produces a feeling of all-over well-being and health. Softens, rejuvenates and prevents dry, callused feet and other foot ailments like Athlete's Foot. Take better care of your health with the ultimate feet care product from California Home Goods today! DURABLE AND EASY TO USE: Our foot massager and scrubber is made of the highest quality materials and will last for years. 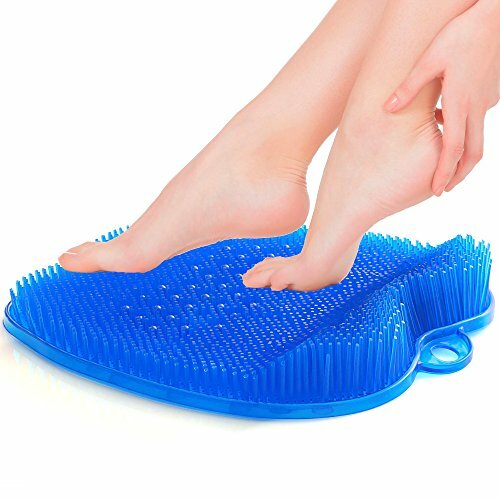 This feet brush is very easy to use, especially recommended for people with hip and back problems - with our foot scrubber, there's no need to bend over; it's excellent for use in the shower or bathtub. 30 DAY SATISFACTION GUARANTEE: Reach out to us if there's ever anything you need; we are dedicated to your satisfaction. Our factory warranty for products and add-on items is only available from the authorized seller California Concepts. If you're unhappy with our feet brush, please reach out to us so we can improve your overall experience. 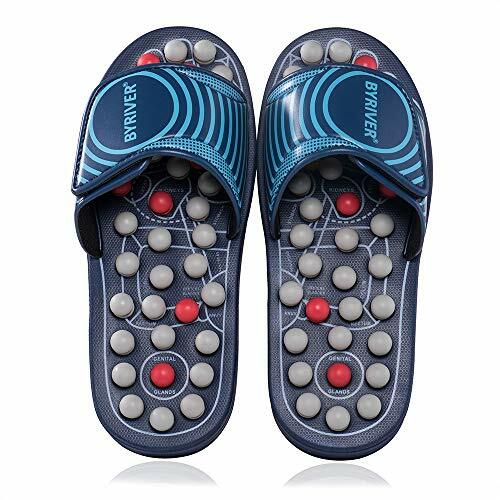 Since we were selling the foot massage sandals from 2017, thousands of buyer send us feedback that this acupressure sandals is very helpful and indeed improve their health. 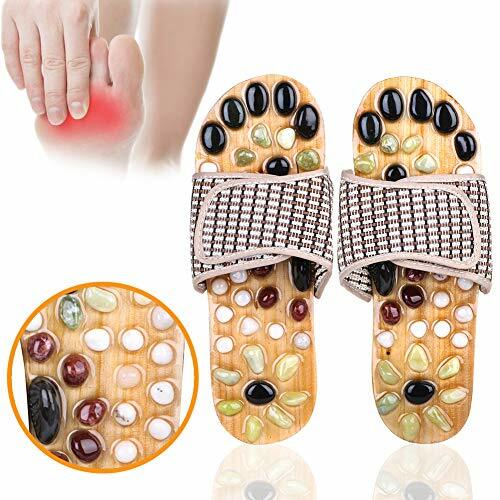 But there is one compalin that this spring acupressure sandals is too srong and too hurt when wearing, especially for sensitive feet and heavy user. So we have developed this new stone foot massage sandals, that is softer and the pain level also accepted by most of user. What is the Benefit of BYRIVER Stone Slippers? RELIEF: Designed to soothe foot/ heel pain & tension due to arthritis, neuropathy, plantar fasciitis. Promotes better blood flow to enhance overall health. CAUTION: This is therapy massage slippers for 15mins wearing per time NOT all day wear casual slippers. It is hurts for first few times using, add socks and shorten the wearing time will help you feel better. GUARANTY: Included 5pcs replacing massage button. 6 months FREE exchange for non-deliberate damage. QUALITY: All materials conform with environmental requirement. 100% QC checked before packaging. The FootMate System is a complete foot care system for cleaning, soothing, stimulating, and massaging your feet every time you shower. Perfect for those with diabetes, arthritis, back pain, tired caregivers, pregnant women and athletes. With diabetes, proper foot care is very important. Poor foot care with diabetes can lead to serious health problems. The FootMate system leaves feet thoroughly cleaned, conditioned, and massaged, including the often neglected areas between the toes. The massage stimulates circulation and blood flow to the feet and produces a feeling of all-over well-being and health which is important for a diabetic patient. The FootMate's wide, gentle inner brush massages your tender soles, while stiffer outer bristles smooth rough skin and calluses, and stimulate circulation. The contoured bristles create a stimulating massage and extra cleaning power for both the bottom and sides of your feet. It's the ultimate foot massage - and the perfect way to pamper your tired, aching feet. The FootMate System comes with 7.5 ounces of foaming Rejuvenating Gel. Footmate Rejuvenating Gel is formulated especially for feet. Contains: Tea Tree oil, Aloe, Gentle Cleaners and Conditioners. Helps to prevent athlete's foot, decrease foot odor and aids in good overall toenail health. MADE IN THE USA! Endorsed by The American College of Foot and Ankle Orthopedics and Medicine. YOUR FEET WILL LOVE YOU!... The American-made FootMate is a complete foot transformation system. Our ingenious foot scrubber is the best foot cleaner you'll find. Not only does The FootMate System clean feet incredibly well, but it's also an invigorating foot massager. In addition to scrubbing the most neglected areas of your feet, the foot massage feature of The FootMate System will stimulate healthy circulation and soothe your feet. Feel better from the ground up! FOOT CARE BEYOND COMPARE - REFRESH, RESTORE, RENEW!... Our American made, elite-quality foot brush system reaches areas of your feet that other products just can't. The ergonomic design features a gentle inner brush to soothe soles, along with firm outer bristles to treat rough skin. You'll get more thorough and satisfying results than you will from a pumice stone, loofah, or standard brush - all while reducing foot odor, blocking toxins, and speeding healing! 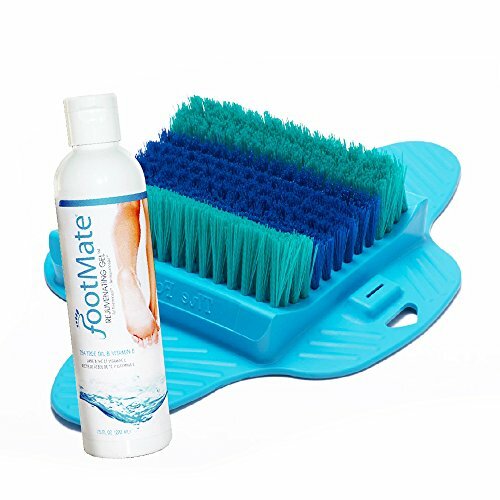 PODIATRIST RECOMMENDED - The FootMate System is specially designed to go in a bath or shower to clean and massage your feet, without you having to bend over. FootMate is great for the elderly, anyone with back problems, pregnant women and athletes. Also, It's also a powerful and valuable tool for diabetic foot care. The FootMate System is recommended by the American College of Foot & Ankle Orthopedics & Medicine, a specialty organization of the American Podiatric Medical Association. EMBRACE THE ART OF REFLEXOLOGY - Foot reflexology is the use of pressure and stimulus on the feet to improve overall health. Foot reflexology does more than just make your feet feel better - it is thought to alleviate many ailments including back pain, stress, and headaches. It may also offer potent foot detox benefits. To get the full benefit, foot reflexology massage should be administered frequently, and The FootMate System makes this easy, right in your own home! HIGHEST QUALITY, MADE IN U.S.A. Verified- Choose the absolute best for your foot care and foot massage needs! We consider ourselves to be the Ferrari of foot care. The FootMate System is a verified American Made Beauty Product, with an innovative construction that includes a contoured design, with more than 11,000 bristles, quality mildew and stain resistant materials, suction cups and footpads for safety, an anti-skid surface, and a mildew resistant retrieval rope for easy lifting. Enjoy MagicMakersa Dual Foot Massager, Relax Your Feet & Mind Indoors Or Outdoors. Simply place it under your feet and treat yourself to a deep, relaxing and soothing foot massage. Acupressure Massage: Place your feet on the massager, where you will need the relief . Press your feet down and feel the pressure of all 5 rows of rollers on your feet for 2-3 seconds. Release and relax. Great for targeted stimulation or when you do not wish to move your legs too much. Your tired aching feet need a vacation, to refresh itself and feel new again. Your feet deserve the relief, and you deserve the comfort! 4. Wearing high heels people. 5. Standing, sedentary or using leg workers for a long time. Foot massager is covered by our No-Hassle Guarantee. We will replace or full refund your purchase if you are not satisfied with it. Simply contact us & we will do our best to resolve any product issues for you. 24 hours customer service, 30 days full refunds and well package. The best service, we offer secret protection and will provide cautious packaging. Get a simple way to soothe your feet!Release yourself from feet pain at once. Truerelax wooden foot massage,a reliable product designed by Ergonomics,and its shape matched the human feet radian,is an effective therapy for sore feet and this product is also an acupressure for plantar plantar fasciitis. 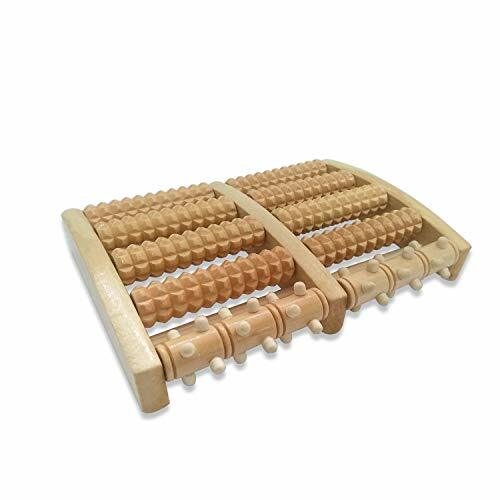 In terms of physical properties, this wooden foot massage is made of high polished wood,which is a kind of durable material and harmless for health.this product is light and portable,and it adapt to different occasions from home to office. Soothe your feet through an easy way by rolling feet on it. &The shape of each roller is in rhombus,enlarge the massaging surface,enhance the blood flow. &Exquisite craft &quality assurance,made of durable solid wood,covered by green paint. &Portable,and don't take up much space to use&deposit. This is also a perfect gift for mom and dad !Care your parents from the bottom of the heart and body. Feature:Feature:Designed by Ergonomics&matching human feet radian& therapy for sore feet. Function:Massage sore foot/relax oneself from pressure&acupressure for plantar fasciitis. Application:Wide applications from home to office occasions,gift for mom and dad or yourself&portable with light weight at 1.2 LBS&for all feet size and ages. Quality:Top grade/made of high quality polished Beech wood/durable material&covered by harmless paint. Covers defects&damage. We will replace or refund your purchase if you are not satisfied. Size: Big one 7.48inch long ,1.77inch wide ; Small one 6.29inch long ,1.37inch wide . Double Header With Dual Side Smooth Heads For Real feel . 1) Take a bag and put it into the foot scrubber. Add about 75 ounces of boiling water and soak for 5-10 minutes to separate the essential oil from the herb..
2) then add appropriate warm water, the water depth reaches about 2/3 of the calf, the water temperature reaches about 45 degrees, put the feet into the foot bath and start to soak. 3) Soak about 20 minutes each time until your body relaxes. Ingredients - Rich in 8 plants: Prunella vulgaris, wormwood, dried ginger, cork, Sophora flavescens, green tea, rose, jasmine. For foot spa, exfoliation, athlete's foot, etc. 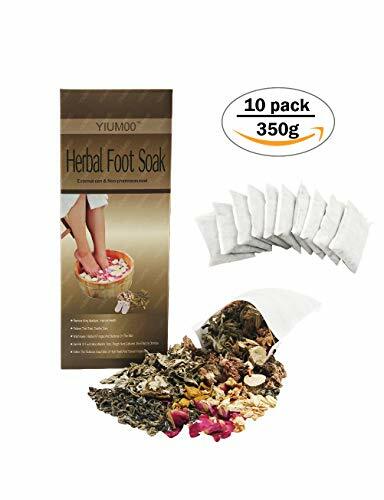 Repels body chills, promotes blood circulation, relieves pain, rejuvenates, improves foot odor, and makes the body more comfortable and relaxed. Content: 10 packs per box, 350 grams/ box, one pack each time. Empty inside. For man Only. Made of high quality PVC, no odor and moderate softness. The minimum is 4.7cm and the maximum is 6cm; it can be used by junior advanced players. Unique design-- narrow rounded tips allow for a comfortable,easy glide and no discomfort due to the natural contours and soft silky material,giving you a incredible feeling. 100% MEDICAL GRADE SILICONE - Made from the safest high quality material, it s latexfree,phthalatefree and hypoallergenic.Cleaning is very easy with a little warm water and regular soap. SUCTION CUP & FLARED BASE - The flared bottom handle acts as a dual functioning suction cup and safety stop.This allows for handsfree fun or prolonged wear without the worry of it slipping inside. ELASTIC & FLEXIBLE TO BEND:Not easy to break off, use or pull at different angle. Soft and elastic, can be bent at any angle without deformation, 100% waterproof. Soft and comfortable, imitating the human body structure, bringing you a real experience. Ergonomically designed to relieve muscle tension and suitable for use in the neck, back, legs and feet. Madewith medical-grade silicone material, non-toxic, odorless.velvety smooth and perfectly formed, also extremely stretchy, feels like real skin. Comes with irregular convex inner particles, fine-grained structure, and irregular gutter will give you the best feeling in the world. Relieves Tension Your muscles can become very tense due to overuse or repetitive use during a rigorous workout or a sitting at a desk all day long. 10 different modes meet your needs. Can be used in shower and washed with water, working noise less than 30 decibels. 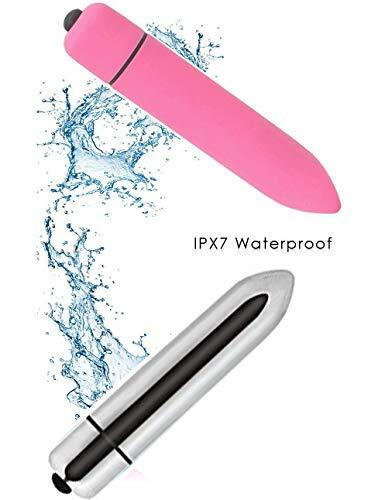 Waterproof : Safe and waterproof design for the part of massager, easy to clean.Use it when bath time,brings you nice feeling.